Check out Susie's grandma's embroidery - gorgeous! 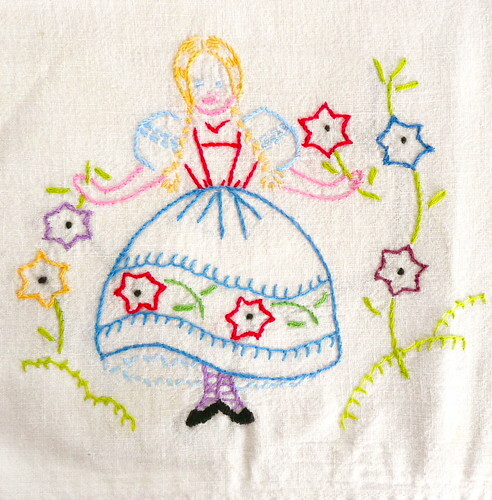 See more pics of her grandma's tea towels on Susie's blog. You can see where she gets her talent. Did your grandma leave you any vintage gems? Why not snap a pic and add them to the pool? Sadly, not everyone treasures the handwork of their grandmothers. We see it embroidery like this all the time at antique stores. Thanks for sharing my Gram's work! How fortunate to have such family treasures! My [Grand]Mama did one better (as did Susie's!) She taught me how to embroider, knit and sew! Some day i will inherit her handy work but for now my Mom (her only child) enjoys it. And Susie, I see lots of it in stores too. I wish I could buy it all so it would have a loving home. What a treasure! This piece is so charming! I can only hope my kids & grandkids treasure some of the stuff I make years from now!